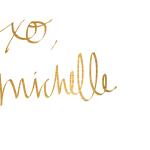 If you’ve followed my blog for any length of time, you know that my love for Whole Foods Market runs deep. As that old song / sonnet / poem goes, “Let me count the ways…”. Or is it “thy” ways? I’m not geeky enough to know the answer to that so apologies. You may need to get the Google out and check. Ok, back on track… Just in general, I love how many options Whole Foods Market provides for special diets, in my case paleo and grain-free. I have to say it’s so refreshing to walk into a store and know I have unlimited options in terms of food. Because truly, isn’t it the worst when you’re at a restaurant or store and there’s really nothing to choose from that you can eat? Talk about major food disappointment. Whole Foods Market is like that awesome, cool Aunt you have that gives you a giant hug and says, “I understand, I got your back. Now let’s go have a gluten-free, raw macaroon” and all is right in the world again. So yes, WFM is a haven for special diets wether it be paleo, vegan, raw, gluten-free etc. But I love that no matter what your dietary preference is, we can all agree that their produce department rocks. It’s the great unifier. I honestly feel when I walk into their produce department that I’m at a Farmer’s Market. Minus the hummus guy begging you to take a sample of his hummus and falafel of course. WFM sources a great deal of their produce locally, so for me I can find fresh produce from Frog Hollow Farms there which is just about 30 miles away. How cool is that? In addition, they work with local farmer’s to improve standards for farm workers and the environment. From there they then rate produce as “responsibly grown” once they meet the standards that WFM has set. The variety of WFM’s produce is always on point, particularly on organic and seasonal produce. Did you know that they even keep their organic produce separate from conventional to prevent cross-contamination? I didn’t know that for a long time. And now that it’s fall, they are LOADED up with seasonal squash. 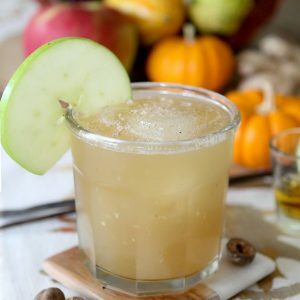 Which is what inspired this recipe. So let’s get to it shall we? 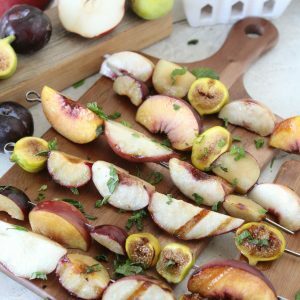 I really wanted to create a seasonal recipe that showcased the produce I could find at Whole Foods Market as well as keeping it something super easy for you to make because I know we all love easy. 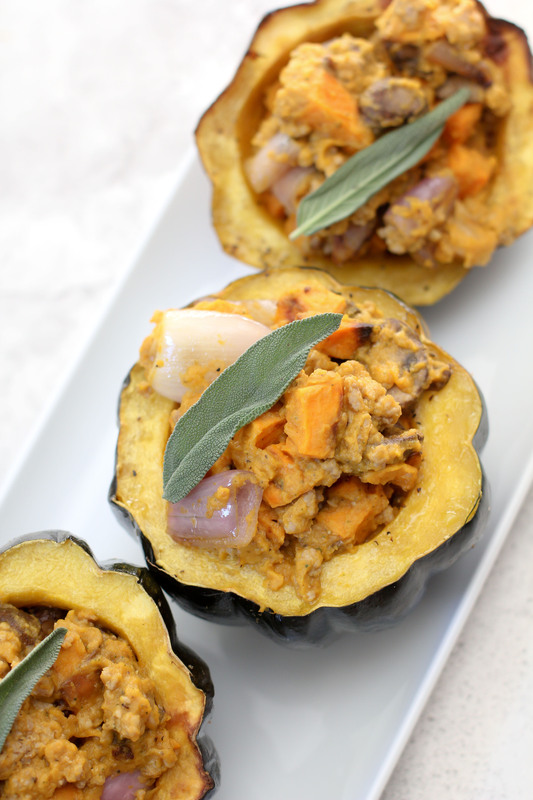 I love that you can make this Autumn Stuffed Acorn Squash and it has your dinner covered without having to make additional sides. One and done! AND this will leave you with tons of leftovers. If you’re making this for just yourself, I suggest you halve the recipe. 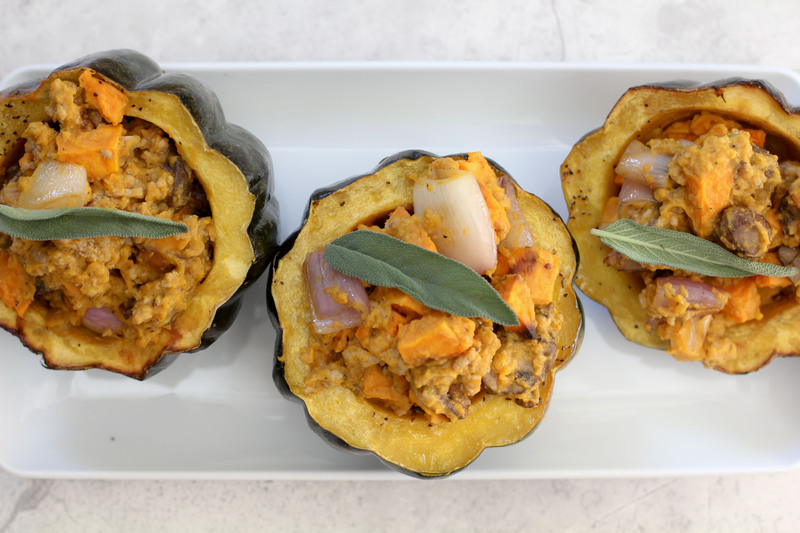 I wanted to cram as much veggie goodness into this recipe as possible without overdoing it so here’s a full run down on all of the veggies this recipe is gonna load you up with… Acorn squash, pumpkin, shallots, mushrooms and sweet potatoes. Not to mention garlic and sage. Because I wanted this to be a complete meal, I needed to add a protein to it so I went with ground pork. I know we’re chatting a ton on produce but can I touch briefly on WFM’s 5-Step Animal Welfare Rating program? I LOVE the transparency in their meat department. It’s all labeled according to their rating system and tells you exactly where everything has come from. Love! In short, here’s what we have. 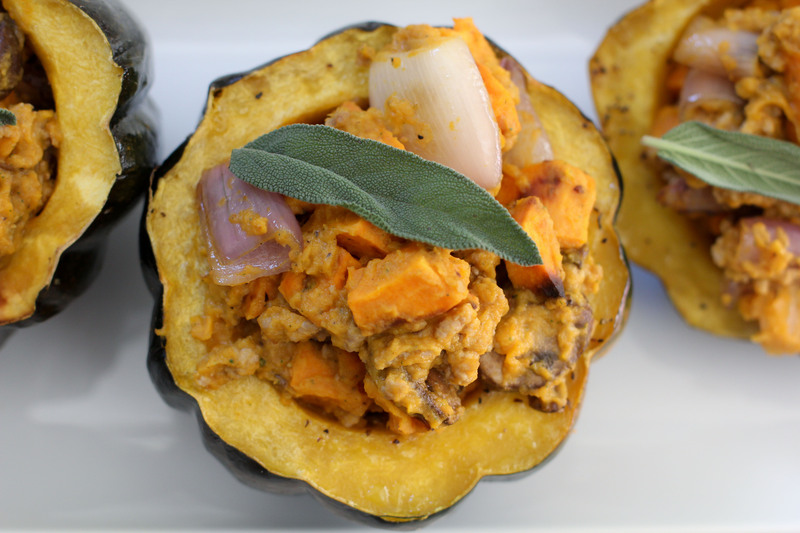 Roasted acorn squash stuff with some roasted sweet potatoes, sautéed onions and mushrooms all tossed together with a fresh pumpkin and sage sauce. Are you guys in or WHAT? This is also the perfect meal to make when you have guests coming over. 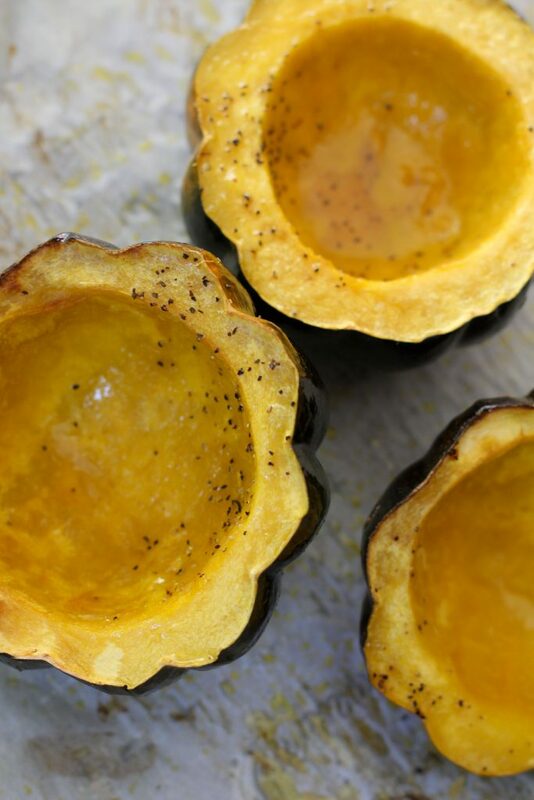 I suggest making the components ahead of time, assembling the squash and just giving it the final roast to warm everything together when your guests arrive. 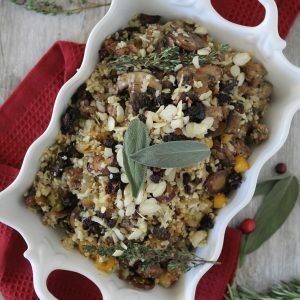 Everything in this recipe is pretty self-explanatory but before you make it… you have a chance to win a $500 gift card to Whole Foods Market now by signing up for their newsletter, so hop to it and click here. A seasonal Autumn Stuffed Acorn Squash from the Whole Smiths that's paleo-friendly, Whole30 compliant and gluten-free.